Governor Rick Snyder says the state will take a dramatically new to approach to its worst schools--starting in Detroit. Years of turmoil and power struggles over the Detroit Public Schools have left a polarizing legacy in the city. That history has left many Detroiters absorbing Snyder’s plan with a cautious sense of déjà vu. You had to have a media badge or be on the guest list to attend the press conference at Renaissance High School Monday. That didn’t sit well with more than a few people, some of whom exchanged words with security guards and frazzled gatekeepers who blocked a main stairway. That “authority” Snyder is talking about is officially known as the Education Achievement System. It’s basically a statewide school district—established through an agreement between the state and Eastern Michigan University—for the state’s 200 lowest-performing schools. 39 of those schools are in Detroit. The idea is to make those schools more like charter schools, with more autonomy for school staff. State education officials say that strategy has yielded good results in other cities. They say the authority will also have a leaner central office, more focused on supporting teachers and getting resources to the classroom. Snyder says he’s empowering the Detroit Public Schools’ current emergency manager, Roy Roberts, to start the process with failing Detroit schools by September 2012--with an eye toward gradual expansion. “We’ll look at moving schools into this Educational Achievement System-- starting as a pilot here in Detroit, to incubate that success system,” Snyder said. The announcement answered big questions about the state’s basic strategy for dealing with failing schools—and how it will tackle failing Detroit schools in particular. But it also raised a lot of big questions that didn’t get answered. When a member of the elected Detroit school board asked Roberts how the new system would affect the existing district’s finances, Roberts tried to downplay the question. But it’s those kinds of big, unanswered questions that have many in Detroit—teachers, parents, and elected leaders--worried that “the devil is in the details.” And there’s also the sense they’ve been here before. A “state reform board” ran the Detroit schools for a good part of the last decade, and Roberts is the second emergency manager since 2009. Detroit State Representative Thomas Stallworth sees a lot to like in the state’s reform “concept”--but he’s also cautious. And then there’s what might be the biggest concern for most Detroiters—what happens to the schools that stay regular Detroit Public Schools? Snyder and Roberts say changes are coming—both in terms of more charter-style autonomy for those schools, and a smaller central office. But in a district where every teacher right now has a pink slip, there’s still pressing concern about the its remaining $327 million deficit. David Arsen, Professor of Educational Administration at Michigan State University, says there’s legitimate concern that moving students out means losing state money--but keeping all the old financial liabilities. “That means that unless accommodations are made in the district’s debt burden, it will become an even larger share of the budget for the district’s remaining schools,” Arsen says. Arsen believes that with so many unanswered questions, it’s just too soon to tell how this will all play out Detroit schools. But as this dramatic reform effort takes shape, people across the state—especially those involved with schools on a certain Michigan Department of Education list--will be watching very, very closely. Michigan will try a drastic new approach to fix its failing public schools. The state will put what it designates as “persistently low-performing schools” in a special, statewide school district. The effort will start in Detroit. The city’s public school system has gained national notoriety for its rock-bottom test scores, and is already run by a state-appointed emergency manager. 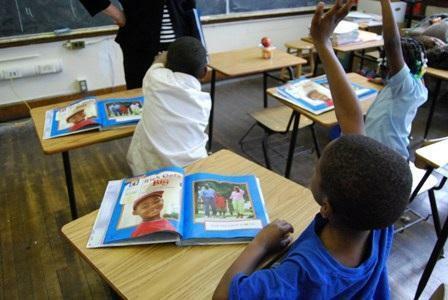 That manager will jumpstart the effort to put some Detroit schools in what the state is calling an “Educational Achievement System” starting in the fall of 2012. Dan Rather will air a special two-hour program on the Detroit Public School system titled "A National Disgrace." It will air on HDNet Tuesday, May 10 at 8:00 p.m. eastern as part of their "Dan Rather Reports" program, and will be re-broadcast at 11:00 p.m. on the same night. The special takes its title from a controversial comment by U.S. Secretary of Education Arne Duncan and presents an unflinching look at corruption, mismanagement and failure. Tens of millions of dollars have been stolen from the district. And a school board bickers over trivialities, while their students score at the bottom on national tests. 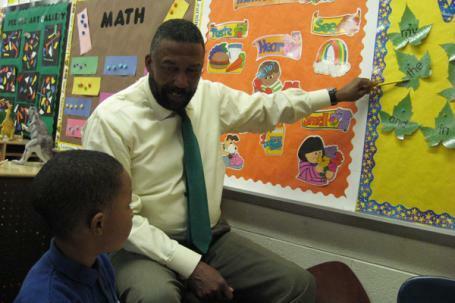 In Detroit, the school district is grappling with a $327 million dollar budget deficit. That’s led the district’s state-appointed Emergency Financial Manager, Robert Bobb, to put forth a deficit elimination plan that would close half the district’s schools. Bobb himself calls the deficit elimination plan “draconian.” In January, Bobb gave it to the state of Michigan, warning it was the only way for the Detroit Public Schools to in his words “cut its way out” of its deficit. The State Department of Education says that’s exactly what Bobb should do. That was Bobb’s cautious take on the subject last week. He backed away somewhat from one of the plan’s most staggering provisions—60 kids in some classrooms. But he says class sizes will go up as the district closes about half its schools. The plan also calls for replacing individual school principals with “regional” ones, and cutting all general bus service. Word of the huge cuts is just trickling down to everyone. Maddie Wright found out when she attended a workshop at the Marcus Garvey Academy on Detroit’s east side. Wright, who’s raising a grandson in the seventh grade, says she doesn’t like the idea of less individual attention for kids—especially in subjects like math, where she struggles to help with homework. Bobb has proposed another alternative. That’s to put the Detroit Public Schools through a bankruptcy process similar to what General Motors did. It would allow the system leave much of its debt behind, and emerge with a new balance sheet. Detroit State Representative David Nathan, a Democrat, says he’s all right with the bankruptcy option. But he says state officials have told him that even talking about it will hurt the state’s bond rating. But the state’s Education Department nixed that option. State Republicans are also pushing legislation that gives state-appointed financial managers broad powers, including the right to throw out union contracts. Democrat Nathan says he’s working on a compromise bill that would avoid both bankruptcy and the worst cuts.